In 2002, I got my first cell phone. June was stuffy in Manhattan, and my summer internship copy-editing the New York Sun, the now-defunct right-wing newspaper, was just about to start. I swam through the humid air past Madison Square Park to get to the store before closing. "You want this one," said the salesman at the RadioShack, pointing to a sleek model then on sale. "It's a 3G phone. It'll work with Sprint's new 3G network they're rolling out later this summer." Fig. 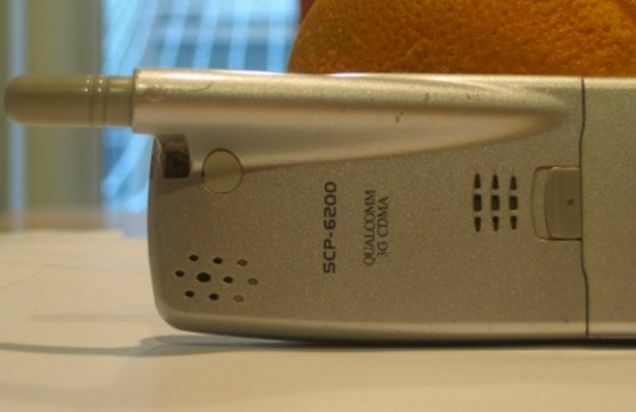 1: Sprint's Sanyo 3G phone, circa mid-2002. An orange of more recent vintage looks on. Sprint launched nationwide 3G service in the 2002 third quarter. The service, marketed as "PCS Vision", allows consumer and business customers to use their Vision-enabled PCS devices to take and receive pictures, check personal and corporate e-mail, play games with full-color graphics and polyphonic sounds and browse the Internet wirelessly with speeds up to 144 kbps (with average speeds of 50 to 70 kbps). I called Sprint and tried to subscribe. "Sir, you need a 3G phone to sign up," they told me. "I have one!" I said proudly. "It says 3G CDMA right on the back!" "Oh, I'm sorry sir. We've changed the labeling of that model. That phone doesn't have true 3G. It doesn't say that on the back any more. 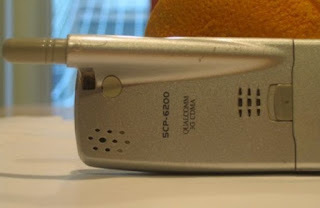 If you like I would be happy to sell you the next model, the SCP-6400, which has true 3G." "No, thanks," I said, thinking that 3G was pretty much a crock, while wryly appreciating RadioShack's ability to make you feel cheated even on a $30 cellphone. Sure enough, when my phone died and had to be replaced, I saw the new one only said "QUALCOMM CDMA" -- no more "3G". It had been revised downward. ATLANTA, June 30 -- Cingular Wireless today announced the world's first commercial deployment of wireless services using Enhanced Datarate for Global Evolution (EDGE) technology. Cingular's initial EDGE service offering is in its Indianapolis market, with subsequent deployments expected later in the year. Building on more than a decade of wireless data experience, Cingular's EDGE technology enablestrue "third generation" (3G) wireless data services with data speeds typically three times faster than those available on GSM/GPRS networks. Cingular began offering its 3G service EDGE (Enhanced Datarate for Global Evolution) in Indianapolis in July, becoming the first commercial wireless company in the world to offer the service. This year, further enhancements have been made to the network with the launch of EDGE in Connecticut, a high-speed wireless data service which gives customers true "third generation" (3G)wireless data services with data speeds typically three times faster than what was available on GPRS. Those of you who care about these things will probably be jumping up and down right now, and/or closing the browser window. "EDGE isn't 3G!" you are saying. "It's 2.9G at best! And neither is 1xRTT, which is all the Sanyo SCP-6200 had. That's barely 2.5G! Maybe 2.75G on a clear day." Detractors and fans are going toe to toe on online forums. Much of the latest criticism is zooming in on Apple's choice of technologies to use with the new phone and its decision to partner exclusively with AT&T Inc.'s Cingular Wireless, which is being rebranded as AT&T. For example, the iPhone won't use the fastest wireless Internet connection available, relying on so-called second-generation, or 2G, rather than faster 3G networks now being rolled out by major wireless carriers. Because of this, industry experts expect features of the iPhone such as Web browsing and downloading not to be very fast. Tim Cook, Apple's chief operating officer, said during a conference call with analysts yesterday the company is sold on Cingular's 2G EDGE network because "it's much more widespread and widely deployed in the U.S." Mr. Cook didn't comment on whether Apple will eventually support 3G but said, "Obviously we would be where the technology is over time." Some people refer to EDGE as 2.5G. Ok, what are some quick takeaways here? What Sprint sold as "3G" in 2002 (1xRTT voice), it rescinded later that year and relabeled the phones. What counted as "3G" for Sprint in 2003 (1xRTT data), isn't any more either. What in 2004 constituted "true 'third generation' (3G)" to Cingular/AT&T, the company had retroactively downgraded to 2G or 2.5G or 2.9G by 2007. From an engineer's perspective, the 3G interfaces, if you read a book on telecom engineering, are CDMA2000 (including 1xRTT and EV-DO), EDGE, and W-CDMA (including UMTS, with or without HSUPA and HSDPA). The International Telecommunications Union has published a standard for third-generation wireless communications, known as IMT-2000, that includes those three and a few others. To a first approximation, the first launch of "3G" in the United States, around 2002 and 2003, was a dud. The carriers responded by dusting themselves off, redoubling their efforts, deploying a new thing and retroactively downgrading their old "3G" product to be... some smaller number of G's. "3G" itself it not a technical term with a whole lot of meaning, especially as it lumps together so many incompatible, competing air interface protocols. The situation for consumers was less confused in Europe, where GSM and W-CDMA are dominant, governments auctioned new frequencies set aside for "3G," and the carrier offerings were more distinct. The same song-and-dance is likely to play out over "4G" -- a term that engineers tentatively apply to aforthcoming ITU standard called IMT-Advanced, and carriers apply to whatever they want you to buy now. You might notice that Sprint is currently selling Mobile WiMAX as "4G." Mobile WiMAX is part of IMT-2000 -- the 3G standard. Verizon Wireless is selling something called "LTE" as "4G" -- it ain't in IMT-Advanced either. Today's "4G" products are like the "3G" of 2002 and 2003 -- they will become "3.75G" as soon as the next hot thing comes out. But the point I really want to make is: this is all a red herring. Focusing on the protocol between your cell phone and the tower -- or worse, spending money on that basis -- is letting yourself be distracted. It's like the secret pick-me-up in Geritol, concocted by Madison Avenue instead of a chemist. A cell phone is essentially sharing a swath of radio spectrum with a bunch of other people within a cell. Think of it like a cable modem or any other ISP. You can have the world's most sophisticated modem, but if it's trying to talk in a tiny slice of spectrum shared with everybody else within miles around (because there aren't enough towers to divide you up into cells), it'll still be awful. How much spectrum has the carrier licensed in my city, and how much is allocated to this kind of modulation? How many other people am I sharing the local tower with? In other words, how big is my cell, and how many towers has the carrier built or contracted with? How much throughput are my cellmates trying to consume? How much throughput has the carrier built in its back-end network connecting to the tower? You might notice that all of these meat-and-potatoes factors involve the carrier spending money, and they all involve gradual improvement in behind-the-scenes infrastructure that's hard to get customers excited. Persuading you to buy a new cell phone with a sophisticated modem and sign up for a two-year contract is a different story. So they don't sell you something measurable where they could be held accountable; they sell how sweet it feels to be using a sophisticated radio modem protocol to talk to them. Don't get me wrong -- UMTS and EV-DO are sophisticated protocols, and a lot of smart people and clever techniques made them legitimate engineering accomplishments. But the boring factors -- the raw resources being shared among the nearby customers -- dictate your performance just as much as incremental improvements in the air interface. What we really ought to care about is the same as with any Internet service provider -- the throughput and latency and reliability you get to the endpoints you want to reach. That's what matters, not the sophistication of one piece of the puzzle. If the carrier sold you "384 kbps Internet access anywhere in the coverage area, outdoors," that would be something you could hold them accountable for. The carrier might even have to put a brake on signing up new customers until it could build new towers or license more spectrum for everybody to share, if it made that guarantee. Some have proposed even more freely enterprising business models -- like having your phone get minute-to-minute bids from the local towers on who will carry your traffic for what price, and accept the lowest bidder who offers acceptable performance. Selling you "3G" -- well, that's a lot easier to live up to. And it changes every year. So don't tell me how many G's your new phone has. We've loved and lost so many G's at this point. Tell me you got a new phone where you pay to get 1 Mbps and 100 ms rtt to major exchange points. When the market moves forward enough to make that a reality, that'll be a generation worth celebrating. Interesting story. Never though of 3G phones from that point of view. I am totally sharing this post this my co-workers at myessayslab.com - I am sure they will appreciate your efforts. Thanks for posting.